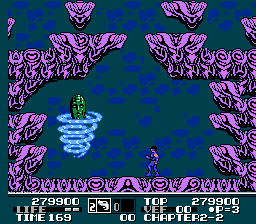 This game is featured in our NES Cult Classics book! Please check it out! 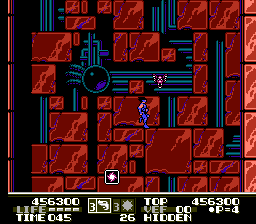 Very few NES games were released by Taxan, the American division of Naxat Soft and a subsidiary of Kaga Electronics. 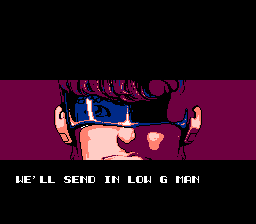 One of their more notable contributions to the NES library was Low G Man, a relatively straightforward action-platformer in which the main attraction is the title character’s amazing high-jumping abilities. 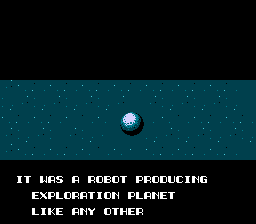 While sounding like a Mario ripoff by the premise alone, the game takes place in what seems like a peaceful future until anonymous aliens raid a planet notable for its robot production, and Low G Man himself is sent in to take care of the problem. 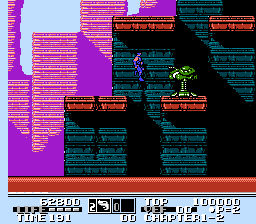 The game was developed by KID, who also flourished with some other fairly decent NES titles like Burai Fighter, KickMaster, and two G.I. Joe titles. Stylistically they have much in common, down to their visuals and slightly offbeat physics. Strangely, most of their titles, including Low G Man, were only released in America and never saw publication in Japan. Rather, they were produced on by Taxan in the US, mostly by marketer Ken Lobb, who later went on to work at Rare and get a gun named after him in Goldeneye. 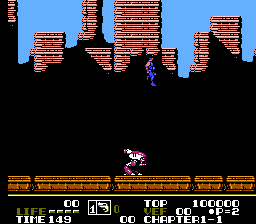 As the title implies, the main innovation is obviously the ability to jump high. Really, REALLY high. 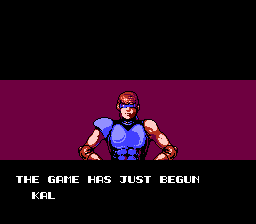 While this sounds unimpressive considering the innumerable amounts of platformer heroes who also have limber legs, Low G Man puts them all to shame. 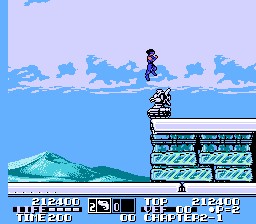 By default, his jump reaches to about two-thirds of the screen’s height, and power-ups cause him to leap up through two whole screens at maximum. 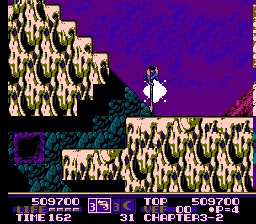 For the most part, it’s fun to leap up to the heavens unless you whomp your head on an off-screen enemy or hazard, which is likely to happen in later stages. Your projectile weapon is a technically harmless electromagnetic pulse (EMP) gun that freezes enemies after a certain number of shots. 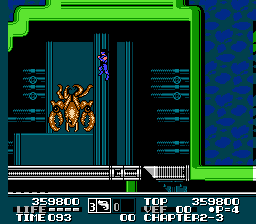 While they remain motionless for about five seconds, you jump on them (or get below them if they are above you) and hold either up and down to attack with a spear of all things. You don’t even have to stun them to stab them, but it certainly helps. Low G Man can also dash, though he certainly does not run as well as he jumps. You can run if you tap left or right twice, but the sensitivity is so touchy that you might accidentally start running when you want to and vice-versa. It’s not too much of a problem, as you will likely be jumping more than running around here. 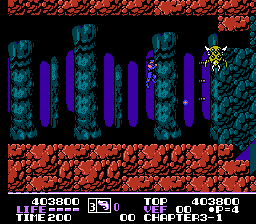 In addition to the good old stun-and-stab method of attack, specific enemies give one of four types of subweapons: fireballs, boomerangs, bombs, or energy waves. They are limited in use, but they grow stronger as you pick up more ammunition for each, with the waves becoming particularly deadly if you manage to stay alive long enough. 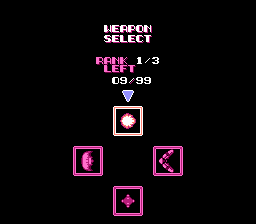 If an enemy doesn’t drop a subweapon, they’ll usually give you one of many other powerups, such as gun upgrades that cause you to shoot more bullets at once, bells that bestow points, spear upgrades that cause your stabs to do more damage, anti-gravity symbols that increase your jump height, invincibility shields, blue potions that restore some life, and rare 1-ups. However, red potions that decrease your life will occasionally fly out, so you must stay alert even after a dispatch. You can also get items from prisoners, though they only appear in a few levels. 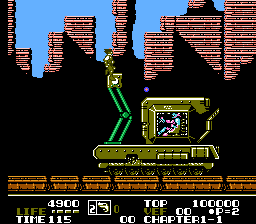 It’s also possible to commandeer three different types of vehicles: a bipedal jumping tank, a bomb-spewing hovercraft, and a gravity-flipping spider machine. 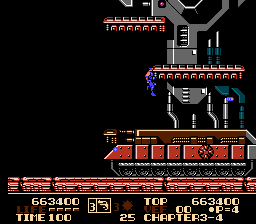 You take them over by standing on the machine as you spear the pilot to death, and you are invincible while in control of them. However, you can only operate them for a limited time until they self-destruct, and each hit lowers the timer by five seconds. 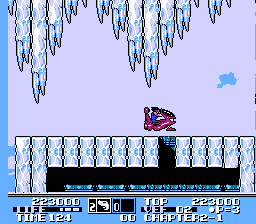 These vehicles also help to get around the levels for when anti-gravity leaping isn’t enough. 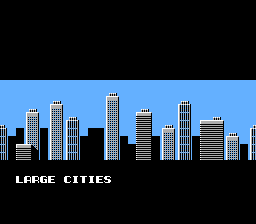 There are fifteen stages in the games distributed over five areas, including an industrial cityscape, an arctic wasteland, and a bunch of ominous caverns. 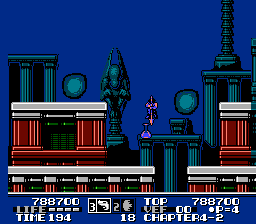 There are also two super-secret stages in 1-2 and 3-3 that allow you to bypass the next stage, as well as a bad hidden spot which sets you back to the beginning of the current stage. 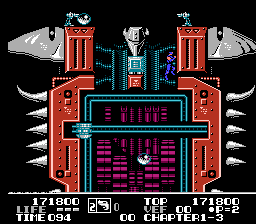 Most of the stages are rather simple in structure and fairly short, but some levels at the end of chapters take place in massive vehicles that are loaded with traps and difficult to survive, let alone reach the boss with a decent amount of health. Low G Man has four bars of health, though most attacks only take away half a bar. 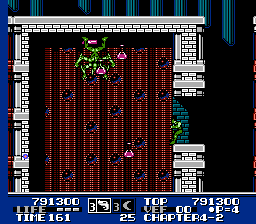 Later on, bosses usually tend to sap whole bars from you if you aren’t careful. 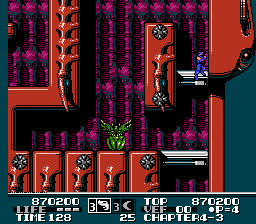 If you run low on vitality, you could stick around and kill enemies while hoping to find blue potions, but this is a game in which the time limit matters. 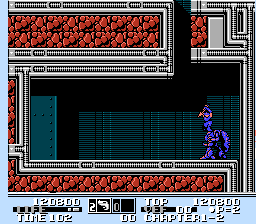 The challenge curve is steady, and while it’s not the hardest game on the NES, it gets pretty dang tricky from area three onward. In addition to some mostly fun gameplay, the graphics and sound are quite good even if not spectacular. 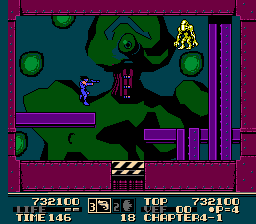 The visuals lend to the game a futuristic industrial aesthetic, with the backgrounds becoming increasingly darker the further in you play. 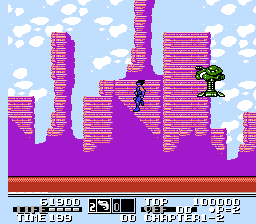 As one of the later games released for the NES (one year before the advent of the Super NES), it makes good use of the NES’ color palette and somehow keeps the graphics appealing without being abundant or fruity. 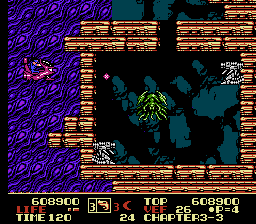 The music is mostly upbeat and encouraging, such as the first area’s cheery fast-paced theme that clashes with the somewhat grim-toned game. The music for area two, arguably the best track in the game, fits well with the arctic wasteland scenario. 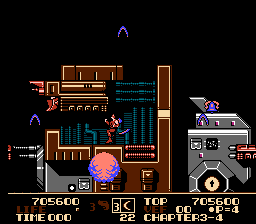 None of the tracks would likely land a spot on any top game music lists, and a few are actually pretty annoying (such as area three’s middling and repetitive tune), but there has certainly been far more damage done on the NES sound chip than Low G Man‘s above-adequate offerings. From a technical standpoint, the biggest knock against it is the choppy animation, which affects everything from movement to screen scrolling. 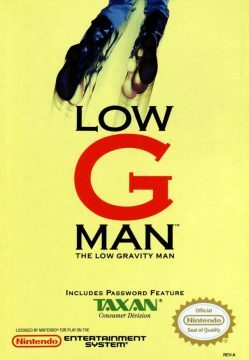 Examining Low-G-Man as a whole reveals that it is not a particularly innovative title, but that is not necessarily bad. 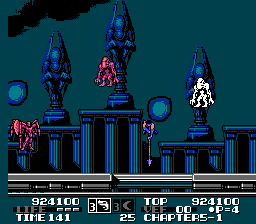 Its giga-high jumping protagonist and unorthodox weaponry are interesting gimmicks that add a bit of spice to the standard action format, even if just a pinch. 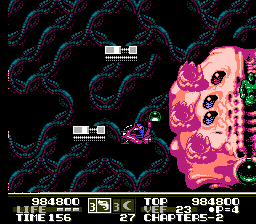 The controls can feel just a bit loose at times, some of the bosses feel lazy, and the difficulty ratchets up to taxing levels in later stages, but there’s nothing too negative to ultimately drag down the game. 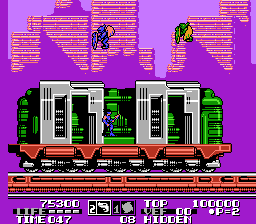 It’s not an all-time classic, but you could do a lot worse than Low G Man amongst the generous glut of 8-bit action-platformers.